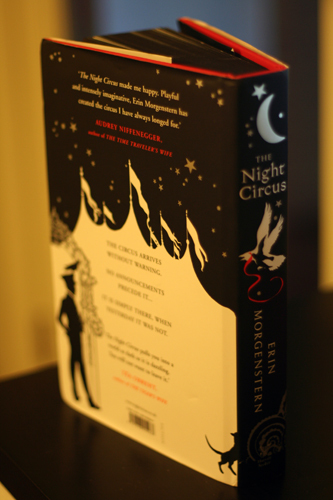 Yesterday I got home after a very long day to find a finished copy of Harvill Secker’s UK edition of The Night Circus waiting for me. Photos will not even begin to do it justice, but I figured I’d give it a try. Look, black-edged pages! 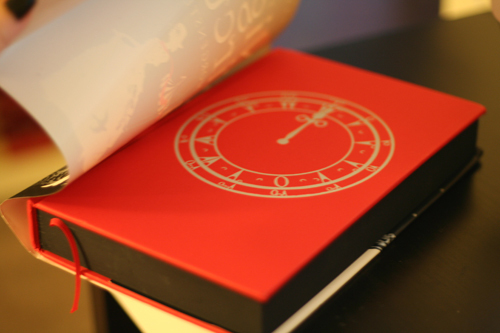 There’s a clock beneath the jacket, set to midnight for the first edition. The time will be changed for subsequent editions. 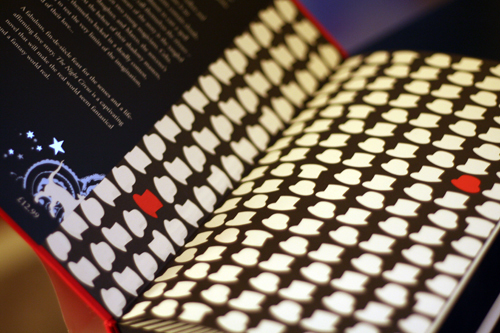 The endpapers have glorious rows of bowlers and top hats! And the kittens disappearing around the edges just make me happy. I keep my heart hidden, I always have. It never felt right to me to leave it exposed. It took me quite a while to find the proper spot to leave it. I tried under-bed boxes and seasonal snow-burying, moving it from location to location for years. 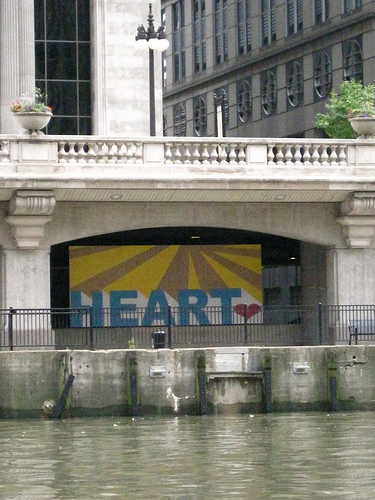 Once I put it under the bridge, which was a difficult feat, I knew that I would leave it there. I have been chided for this precaution, warned by everyone from street sweepers to nosy old ladies in supermarkets that hearts should be worn on sleeves or stylish hats so they may be easily spotted and courted. I smile and nod and assure them I will take their advice into consideration. But I have no plans to move my heart. I am waiting for someone clever to figure out where it is, someone who will realize the under-bridge is accessible from the river. Someone who wants my heart badly enough to brave the waters in order to claim it. I don’t really know what to say about Borders. 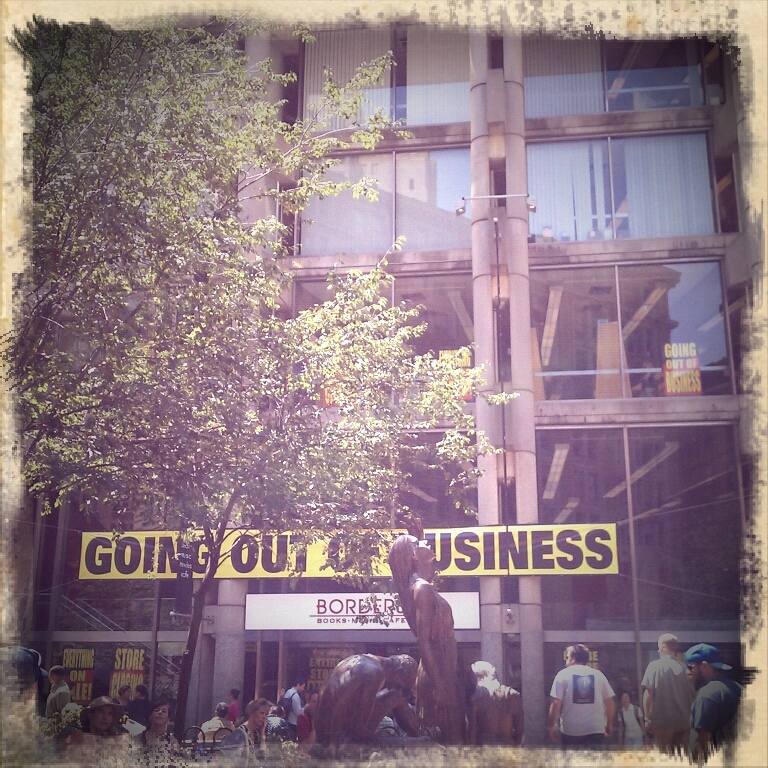 The Borders in Downtown Crossing has been one of my favorite places in Boston for years. Almost a decade ago I spent all my lunch breaks there, while working temporary office jobs. I used to wonder then–fleeting, not-particularly-serious wonderings–if someday I might have a book on those shelves, in that space. I am missing that opportunity by a matter of months. Weeks, really. I visited for what will likely be the last time today. It’s still busy. The checkout line was huge. People are buying books, and I don’t think it’s just because they’re 20% off. I will miss this store. The windows and the light and the old bank vault doors in the back. The almost-always out-of-order escalator. I fell in unexpected booklove in this store, many times, finding the perfect story waiting for me on its shelves. It’s sad. I knew it was coming, but it’s still sad. I hope someone opens an independent bookstore in Boston. I think it could do very well. 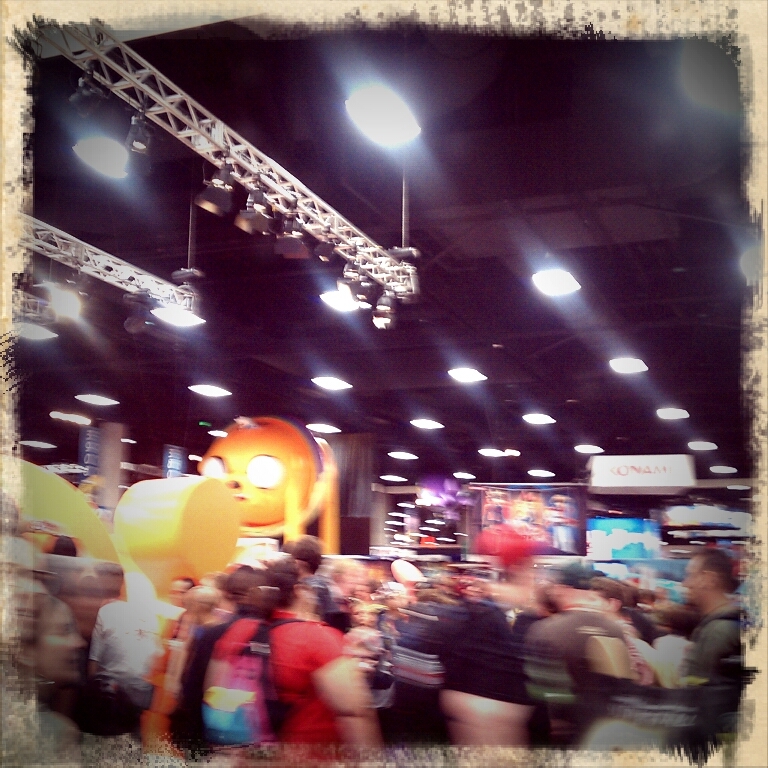 I have heard epic tales of the wonderment that is San Diego Comic-Con International for years. I always thought maybe someday I would like to go just to experience it first-hand but I didn’t think I’d actually be Invited and Official and it’s still hard to believe I was there. I flew out on Wednesday and had the longest flight ever, which probably felt even longer because I haven’t been on a plane in years. I am forever grateful to my agent for suggesting noise-canceling headphones which are the greatest thing ever. I also managed to have brilliant timing weather-wise, as I missed an atrocious heatwave in Boston and the weather in San Diego was lovely. Wednesday night I tried to stay awake long enough to meet my publicist for a drink and failed. Thursday morning started bright and early and dropped me right into the surreality of press conference land, it is a very odd thing to be suddenly faced with a room full of reporters and cameras and flashbulbs and questions, especially once you’re finished and back in the green room again and the cast of Twilight is sitting where you were sitting ten minutes earlier. Then there was a whirlwind of interviews (including one for this piece in today’s USA Today) and the lovely woman who interviewed me for Sirius radio had a fantastic octopus necklace and when I commented on it she told me it was cast from an actual piece of calamari, which I found absolutely delightful. After a bit of running around trying to get my Comic-Con badge I actually got to see the floor, which was bigger and louder and crazier than I’d expected, and I had expected fairly high levels of big, loud & crazy. Wandered around a little bit just to get a taste and tried not to go into sensory overload. There’s just so much to look at it’s difficult to focus. That afternoon I signed posters in the Summit booth, which is both the first time I have signed next to t-shirt pressing machines and also the first time I signed with a DJ doing running commentary about my signing (Thanks, Mike! You were fabulous! ), so that was strange and loud but fun and they had great posters with the book cover art. After that my darling publicist and I went back to the hotel to actually eat something. We ended up with an array of fried vegetables, mostly by accident. I was not aware that one could fry a portobello. Daniel H. Wilson came and met us after a bit of confusion, I think it is a good piece of advice for the ages that when suggesting someone meet you in the hotel bar, you should first make sure you’re in the same hotel. I’d met Daniel briefly during BEA and it was great to see him again, once we actually found him. And then there was catching up on emails and such and then more meeting people for drinks and fried things (including Charlie Yu, author of How to Live Safely in a Science Fictional Universe, who was one of the people and not one of the drinks or the fried things, and also he is lovely and his book has a fantastic title). Thursday night was the Summit party, which was on a gorgeous paper lantern-strung rooftop at the Hard Rock Hotel, and also managed to be baby’s first red carpet. 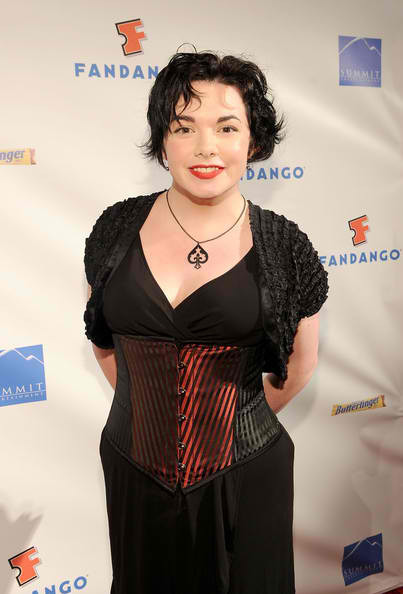 Luckily I was told there were going to be red carpet photos and then that there weren’t, so I had already planned to look pretty decent (and I figured the red and black striped corset was appropriate for a Comic-Con party) and then the actual red carpet was a not entirely unexpected surprise. I’m not sure what’s going on with my hair, but I only had about 20 minutes to get ready and that included corset lacing. The party itself was busy and lovely and I had more interviews (I was not forewarned about those but everyone I spoke with was lovely) and there were celebrity sightings and I got to talk to the other Summit “soon to be a major motion picture” authors, Veronica Roth who I’d met briefly earlier for color-coordinated photo ops and Issac Marion who I had not. They are both lovely, tall people. After that we tried to catch the end of the Random House party but it was already over. There was a mechanical bull. Seriously. So sad to have missed that. I think. Friday morning I signed ARCs of The Night Circus at the Random House booth, which was much more serene than the previous day’s signing so I could actually talk to people instead of straining to hear. I met Craig Thompson and Ernie Cline, which was fabulous because we’d all done the Random House librarian breakfast at BEA in May but I didn’t actually get to meet either of them there. So this time I got to tell Craig how much I loved Blankets and adore the lines of his artwork and I got a gorgeous preview of his new book, Habibi, and he sketched on the back and put me to signing shame, it makes me want to improve my handwriting. (Also, they had one finished copy of Habibi and it is glorious.) And I got to geek out at Ernie about Wil Wheaton doing the audiobook of Ready Player One which I really want to listen to, but in the meantime I can read my marvelous shiny signed ARC. After my signing my official duties were done, wandered around a bit and met Peter S. Beagle, author of The Last Unicorn which is one of my very favorite books of All Time. There’s a new graphic novel version of it and it is absolutely beautiful and he was wonderful, it was magical to meet him, especially since I didn’t even know he was going to be there. Went to lunch with publicist Alison (nothing fried this time!) before she had to catch her plane. She’s the best, truly, and I am a lucky, lucky girl to have her wrangling me. The blurred jaw? Because it moved. Ugh. 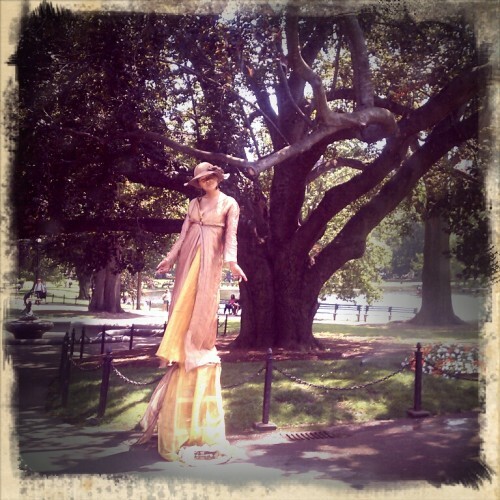 I’m not an easily creeped-out person but that thing was creepy. You know who’s not creepy? Andrea Cremer. She is a delight, I saw that she was signing and had wanted to meet her since we’re agent mates and she said lovely things about the circus. Luckily I found her during a bit of a lull since I walked by later and she was mobbed, but I had time to chat with her a bit and she is infectiously bubbly wonderful. I actually ran into her again later that night in the hotel lobby, along with Heather Brewer and Marie Lu, it was like hitting the YA author jackpot completely by accident. I met one of my marvelous Summit producers to chat, and no, I do not have any movie news but there are meetings and wheels turning and all sorts of people working on things in that mysterious film production way. And then I had dinner with some of the lovely ladies from Random House before going back to pack, since I had to be at the airport bright and early Saturday morning to spend the entire day on planes again. Okay, that was pretty epic but I think that’s it, can hardly believe that was all in just two days. 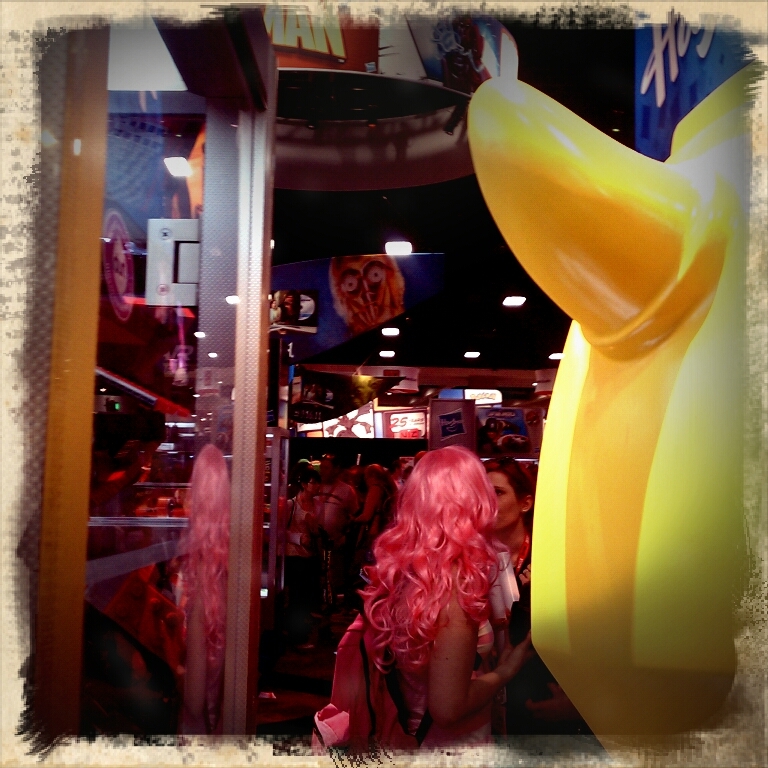 I would have loved to have stayed for the rest of the weekend, really, just to get more of the Comic-Con experience. I do hope I get to go back again. There are more Comic-Con photos over on facebook! 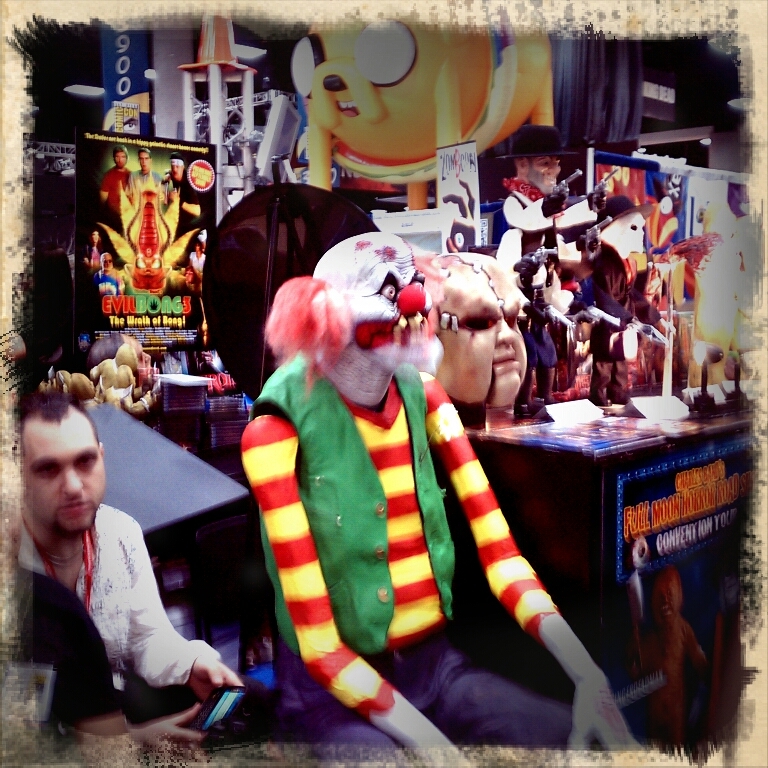 This is not a real Comic-Con recap, my brain is too fried from being on planes all day, but here are a few atmospheric cell-phone photos to give you the general idea of what my last few days looked like. Had a marvelous time, met tons of fabulous people, really wish I’d had more time just to soak in the gloriousness of it all. Back in Boston now, missing both the madness and the weather. Full recap forthcoming! It is a terrible thing, to ache to destroy oneself. And with it comes the constant struggle between destructive desire and the instinct of self-preservation. Alas, there cannot be breathing without burning. And it is so difficult to resist. It is in a dragon’s nature to breathe in flame. Not even a dragon can hold its breath forever. Breath that is life and death tied together in fire-air. When they finally give in, it is bliss, it is perfection, and it is still terrible. 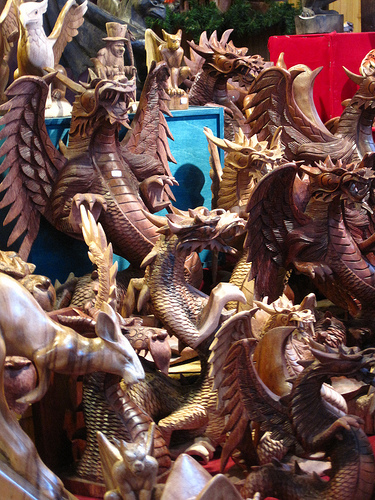 As the flames consume them, each wooden dragon loses itself forever, smoldering in phoenix dreams. Hello, internet! 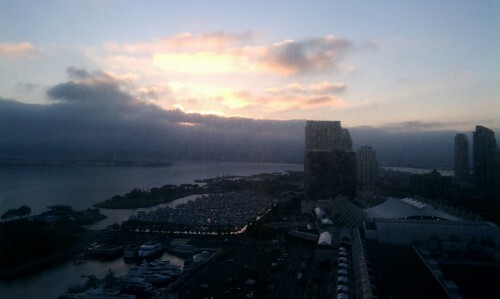 I am in San Diego. 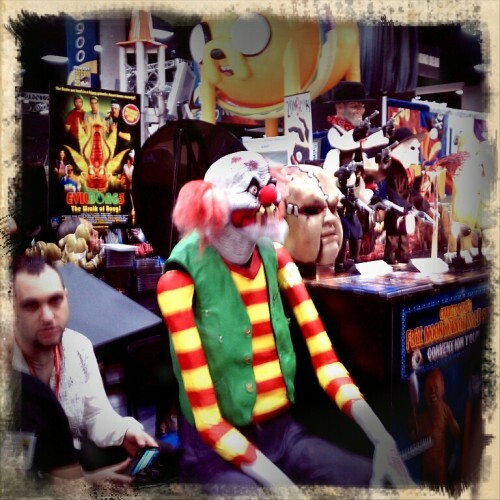 I am at Comic-Con, or rather, next to Comic-Con at the moment but I will be at Comic-Con proper tomorrow and Friday! Tomorrow (Thursday) I will be signing posters at the Summit booth, #4029, at 1pm. 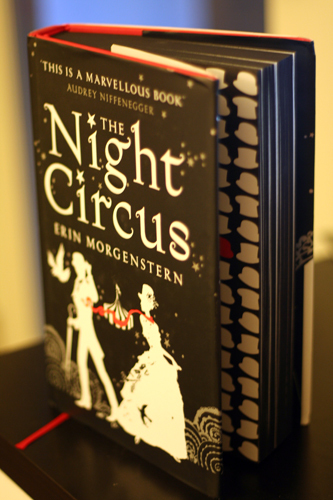 Friday I will be signing ARCs of The Night Circus at the Random House booth, #1515, at 10am. And in between there will be interviews and parties and yes, thanks to Twitter approval, I will indeed be wearing Converse sneakers with seamed stockings. It wasn’t a very difficult technique to learn, though it took a lot of practice. And also some trial and error and a very soapy sofa before I figured out that practicing outside made for easier failure cleanup. There’s a trick to it, beyond getting the size right or launching them so the wind helps with the carrying. I should have realized it sooner, but it’s almost counterintuitive. 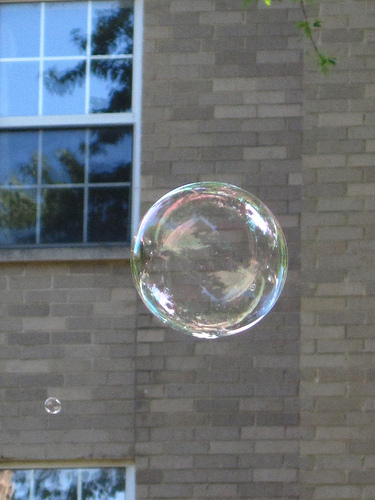 You would think that the contents would have to be lighter than the bubble by necessity, but that’s not the way it works. The vessels are fragile, but the wishes inside them need to be strong. Strong wishes are heavy things. But the stronger the wish, the longer they’ll stay afloat. Halfhearted, wistful wishes pop almost immediately. A heavy wish, properly supported and contained, can float long enough to come true. Spent just about 24 lovely hours in NYC. Arrived back in Boston with circusified momofuku milk bar cookies and a personally signed copy of The Last Werewolf. Met a lot of lovely bookish people during my very quick trip and had a delightful time and did I mention the cookies? 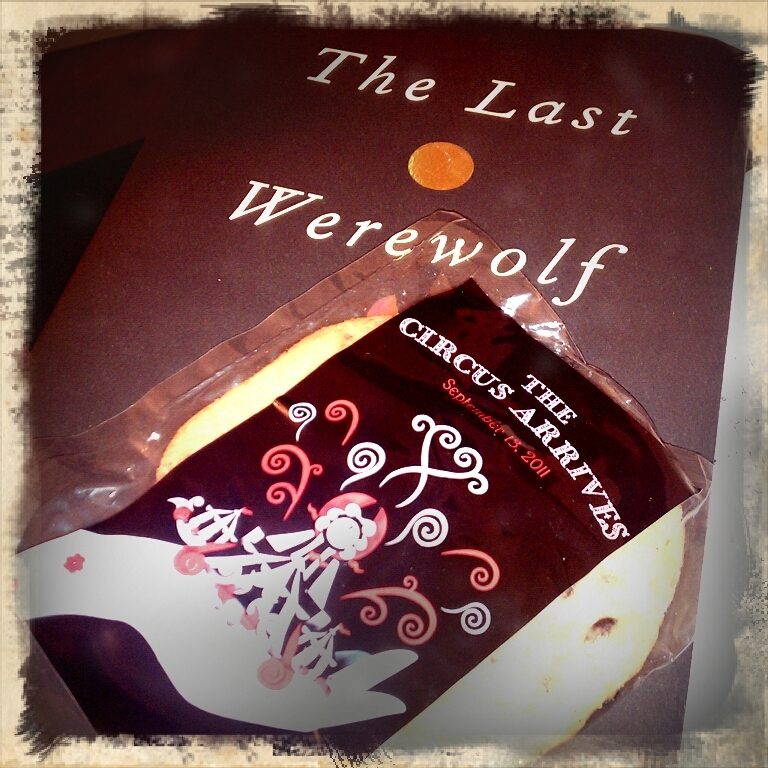 Now I have to tackle the ever-growing to do list, but I have cookies & a shiny new book so I am a happy puppy. Living statue in the public garden. 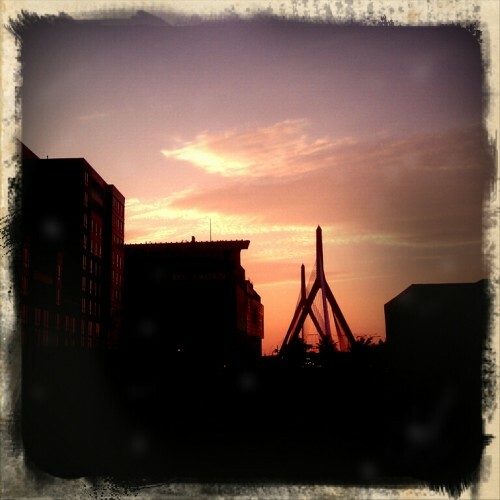 Boston is starting to feel like home, slowly but surely.